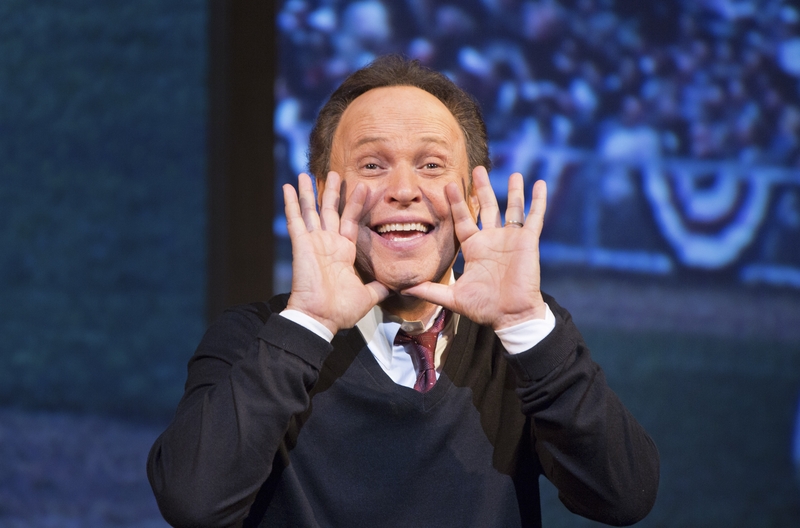 LOS ANGELES – When he turned 65, Billy Crystal decided to reprise “700 Sundays,” his Tony Award-winning 2004 one-man show. The title refers to the number of Sundays he had with his father, Jack, before he died of a heart attack when Crystal was just 15. “I never felt that I was done with the show,” said Crystal, now 66, relaxing in one of the overstuffed white sofas in his Beverly Hills office, decorated with posters and pictures from his films such as “When Harry Met Sally,” “City Slickers” and “Mr. Saturday Night,” as well as photos of him with such friends as Muhammad Ali. HBO, with whom Crystal had done comedy specials as well as the Comic Relief shows, had long pursued him to tape the show. And in early January, nine cameras captured two performances of “700 Sundays” at the Imperial Theatre. The special premiered Saturday evening on HBO and will has multiple viewings today and throughout the month. Nostalgic, sentimental, funny and four-hankie sad, “700 Sundays” is a valentine to Crystal’s past. Crystal takes us back to his days growing up with his parents, Jack and Helen, and his older brothers Rip and Joel in Long Beach, Long Island. Though the community was sleepy during the off-season, the Crystal household was lively. His Uncle Milt founded the famed jazz label Commodore Records, and his father operated the Commodore Music Store in Times Square and produced jazz concerts featuring the likes of Billie Holiday. A lot of these jazz greats would visit the Crystal home. The first time Crystal saw the 1953 film “Shane” in the theater, he sat on Holiday’s lap. Crystal honed his comedic chops performing with his siblings for his colorful, often eccentric family. But in 2001, Crystal didn’t have much to laugh about. Uncle Milt died that July, and then Uncle Berns was taken ill. “I spent that summer getting him on his feet,” Crystal said quietly. The show opened at the La Jolla Playhouse in early 2004 and moved to Broadway in December of that year. After the Broadway run, Crystal toured with the show. But performing “700 Sundays” is different this time for Crystal. The HBO presentation opens with scenes of Crystal revisiting his now-empty family home. “I thought it was a great way to center the story,” Crystal said. Because the house has changed over the years, Crystal called the city manager of Long Beach to get the original floor plans. From those plans, his childhood home was rebuilt on a sound stage in New York. He only got emotional once. He asked McAnuff in post production if they could change the color digitally. Crystal said he’s “in the zone” in terms of his career. Despite weak reviews, his 2012 comedy “Parental Guidance” made about $120 million internationally. Last summer “Monsters University,” in which he reprised his beloved vocal role as one-eyed Mike Wazowski, earned more than $740 million worldwide. His 2013 autobiography, “Still Foolin’ ’Em: Where I’ve Been, Where I’m Going, and Where the Hell Are My Keys?,” was a best-seller, and the audio book version earned Crystal a Grammy nomination. And he’s also returning to series TV next year in FX’s “The Comedians” with Josh Gad (“The Book of Mormon,” “Frozen”).